The Islamic Republic's nuclear drive remains a focal point of international concern. President Mahmoud Ahmadinejad speaks of becoming a pan-regional if not world power. Much of his defiance is fueled by unprecedented oil income. Iran has built a US$82 billion foreign exchange reserve. But behind Ahmadinejad's blustery confidence and defiance, decades-old systemic forces are eroding Iran's economic stability. Iran has suffered perhaps more than any Middle Eastern country from the "oil curse." As Iran became addicted to oil, it postponed reform and let the rest of its economy languish. While record oil prices insulate the Islamic Republic from the consequences of its leaders' decisions, any significant decline may force an internal reckoning. 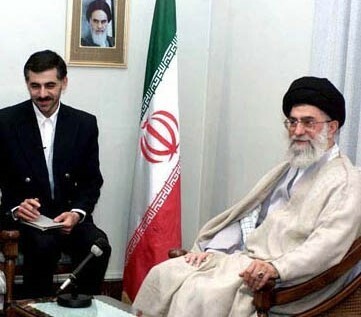 Supreme Leader Ayatollah Ali Khamenei (R), here in Tehran, April 12, 2001, has shown only fitful interest in Iran's economic problems. During his presidency, he consistently advocated the same kind of oil-centered, statist, populist policies that Ahmadinejad now implements. His hatred of the West may contribute to his distrust of economic reform as he sees basic economic principles as Western. As the Islamic Revolution completes its third decade, it would be easy to blame all economic problems on its leadership. In reality, though, economic mismanagement has remained a constant during Iran's imperial and revolutionary eras. Throughout the two decades between Prime Minister Mohammad Musaddiq's fall and the 1973 oil shock, oil exports accounted for more than 80 percent of Iranian foreign exchange income. Broadly speaking, without the revenue it earns from oil, the Iranian government would have been half its actual size. Iran used its oil income efficiently through 1972, funding reasonable development projects and social infrastructure. The proof is Iran's exemplary record of economic growth: In a 2004 report, the International Monetary Fund (IMF) concluded, "During 1960–76, Iran enjoyed one of the fastest growth rates in the world: The economy grew at an average rate of 9.8 percent in real terms, and real per capita income grew by 7 percent on average. As a result, GDP [gross domestic product] at constant prices was almost 5 times higher in 1976 than in 1960." Oil price increases do not affect these figures, which are adjusted for price increases. Iran's oil output increased far beyond the pre-nationalization peak of 600,000 barrels per day (b/d). This expansion was driven by the shah, not by the consortium of international oil companies producing in Iran. The image promoted by Iranian nationalists and some historians that Musaddiq stood up to a shah who had obediently provided oil to the West is distorted; in reality, the shah spent twenty-five years pushing international oil companies hard to get more money for Iran. The concession he negotiated with the international oil companies after Musaddiq's overthrow was much more favorable to Iran than the pre-nationalization agreement, providing a 50-50 division of the profits. By 1960, revenue was more than eightfold above the 1950 level, a figure only partly due to a 50 percent increase in output. The National Iranian Oil Company (NIOC), founded in 1955, sought smaller oil companies willing to accept a 25-75 profit split in favor of Iran to develop fields outside the concession area, that is, the area over which the consortium of international oil companies had a monopoly. The shah kept pushing for more revenue. The February 1971 "Tehran accord" between six Middle Eastern Organization of Petroleum Exporting Countries (OPEC) and the major international oil companies forced the latter to agree to higher prices and better terms. By 1973, the Iranian government, not the oil companies, was in the driver's seat, setting prices, owning production fields, and determining output levels. However impressive the rise in the macroeconomic aggregates, they do not even begin to show the truly radical transformation of the Iranian economy. In less than 15 years, modern roads and air services have reduced distances many fold. In provincial centers, sleepy repositories of a crumbling past, new industries have sprung up, urban facilities are being built up to truly European levels ... In the new factories and on the construction sites, a nation of farmers and nomads has learnt the technical skills of the modern age. … Iran has built itself the bases of a large, complex, modern economy. Initially, agriculture—the main source of income for most Iranians—did not share in the boom. While the data is spotty, it appears that output of the staple food crops rose less than 2 percent a year from 1953 through 1962. It was this agricultural stagnation which provided the backdrop for the shah's 1962 decree of Iran's first real land reform, part of a package of reforms that set the stage for the 1963 riots led by a reactionary cleric and future ayatollah named Ruhollah Khomeini. Iranians gave the shah little credit for Iran's booming economy and the accompanying rapid rise in income. Rather, the general mood of the time was one of unmet expectations. The shah had promised the Iranian people European-style income, and he could not deliver. In a 1974 interview, the shah promised, "In twenty-five years, Iran will be one of the world's five flourishing and prosperous nations ... I think that in ten years' time, our country will be as you [in Britain] are now." The shah's forecast, which reinforced Iranians' self-conception of their country's natural greatness, exacerbated the expectation gap. Part of the problem was that not everyone in society benefited equally from the prosperity. While the spending power of poor Iranians increased, so too did the gap between the poor and the upper class. There was also a huge geographic disparity; in 1971, average household expenditures in Tehran were more than two and half times those in the impoverished southeastern province of Kerman. But the greater political problem for the shah was that economic modernization was not well accepted by Iranian intellectuals. The dominant intellectual trend at the time was Third Worldism, a mix of socialism and anti-imperialism which blames the West, the United States, and the local elites who pursue harmonious relations with the West for the shortcomings of developing countries. In Iran, Third Worldism went beyond the usual neo-Marxism to assume a strong nativist character. One of the most influential books of the period was Jalal al-Ahmad's Gharbzadegi (Westoxication). Ahmad argued that Iranians risked abandoning their culture in favor of the West's, a eulogy for a passing era that melded Iranian nationalism with anti-Western discourse. The 1979 Islamic Revolution was not about the economy, but the economic situation certainly helped undermine the shah. After oil prices rose rapidly in 1973, the shah predicted the rapid transformation of Iran into an advanced industrial country, but Iranians watched as government mismanagement squandered much of the oil wealth. Paradoxically, the post-1973 flood of oil income slowed growth: Too much was attempted, and the resulting logjams stopped progress. In contrast to the preceding decade, the government badly mismanaged the economy after 1973. Government revenue from oil rose from $5 billion in 1973 to $19 billion the following year. In August 1974, one year into his fifth economic plan, the shah increased government spending from $44 billion to $123 billion. He pressed ahead full steam on every front, ignoring the serious constraints to implementing so many projects simultaneously and changing policy so frequently. The higher spending on everything from the military, to infrastructure investments, government salaries, and social welfare programs increased demand for goods and services to a level the domestic economy could not supply. Nor could Iran's transport system handle the ensuing demand for imports; in 1975, ships had to wait between 160 to 250 days to enter Iran's principal port, Khorramshahr, at the tip of the Persian Gulf. Tehran had to pay more than $1 billion in charges for ships stuck in ports unable to unload. The combination of high demand and tight supply led to a sharp increase in inflation to an average of 15 percent per year between 1973 and 1978, from an annual rate of less than 4 percent before. Such dizzying economic changes caused a great deal of social disruption and undercut the benefits of higher incomes. Even among the relatively affluent Tehran middle class, raging inflation and the doubling of consumer prices between 1973 and 1978 hit hard. Goals to improve social services were seldom met. For example, while the government planned more than a million housing units nationwide, it built only 124,000. The government tried to blame economic problems on price-gouging merchants, and student squads hauled merchants accused of violating price controls before special courts, which meted out tough punishments. Meanwhile, the shah alienated industrialists when he ordered they sell on generous terms 49 percent of shares in private companies to workers to offset the impact of inflation. Few workers benefited from such stock ownership; for one thing, the stocks were not easy to sell. And the modern professional and industrial classes were unhappy at the high salaries paid to the 60,000 foreign workers, whose very presence insulted proud Iranian nationalists. Also fueling economic discontent was the impact of the overheated economy on the mainstays of traditional Iranian life. The carpet industry, which employed 300,000 people scattered in villages across Iran, for example, could not compete with the salaries available in towns. Adding to the public's frustration was the shah's profligate lifestyle and all-pervasive influence. Few sectors of the economy were untouched by the activities of the Pahlavi Foundation, which managed much of the shah's wealth. Some of the worst policies after 1973 applied to the countryside. What little development funds Tehran allocated to rural areas were diverted into mechanized agricultural corporations, which operated at a loss and did not increase the farmers' well-being. The main impact of the oil boom on agriculture lay in the devastating effect on farmers of the pro-urban development policies. The government used oil revenue to subsidize imports of grain, meat, and milk products, which served to reduce the prices received by farmers. Meanwhile, the government imposed price controls on key crops, most of which were required to be sold through government-run marketing monopolies. The cost of inputs soared while labor was attracted away by better opportunities in the cities. The result was stagnant production. By the time of the Islamic Revolution, agriculture provided only 15 percent of non-oil output and just 9 percent of overall output. By late 1976, the economy was in bad shape, with national income growing only slowly while shortages of electricity, water, cement, and some foodstuffs constrained output and fed popular discontent. At last, the shah reversed course, acknowledging he had wrongly pushed too fast. He appointed a new prime minister who suspended many development projects and introduced an International Monetary Fund-style stabilization program in March 1978. The overheated economy began to cool and inflation abated. But the price of curtailed government spending was fewer new jobs and falling real incomes while the supply constraints caused shortages to persist. The economic constraints played no small part in feeding the political discontent that exploded in Iran's streets in 1978. The Islamic Revolution, of course, was about politics, not economics. Once the revolutionaries came to power, the Iranian economy deteriorated due to both quasi-socialist policies and the war with Iraq. Every time it looked like the revolutionaries would be forced to compromise their hard-line stances, oil income came to their rescue. By the time the Iran-Iraq war ended in 1988, average incomes had dropped by more than half. Grand hopes for postwar recovery floundered as entrenched revolutionaries, who benefited from the crazy-quilt of regulations, reasserted their power, and the government fell back on its old ways of muddling through on the strength of oil income. The economy was not a priority for Ayatollah Ruhollah Khomeini. He quipped, "I do accept that any prudent individual can believe that the purpose of all these sacrifices was to have less expensive melons." Within just a few years, a Third Worldist group of clerics and bureaucrats espousing interventionist policies in the name of social justice triumphed over bazaar merchants, traditionalist clerics opposed on religious grounds to almost any state intervention, and Western-oriented technocrats. Faced with chaos in factories and a banking system close to collapse, the revolutionary government nationalized much of the economy and transferred assets of the former shah and his supporters to revolutionary foundations (bonyads). Only small industries remained in private hands. Over time, the government's control over the economy increased. State-controlled prices dissuaded foreign investment, and the government regulated all economic activity through an unwieldy permit system. Mosques distributed ration coupons. Since the cost of rationed goods was well below market prices, farmers had little incentive to increase output. The manufacturing sector suffered from both price controls and shortages of foreign investment. Making a profit depended on manipulating complicated regulations. In this atmosphere of legal confusion and bureaucratic restriction, the companies that did best were those owned by the state or the bonyads. Because the official exchange rate was not adjusted despite soaring prices, the price of the dollar on the black market increased to more than ten times its official rate. Anyone who could get permission to buy dollars at the official rate in order to import goods was able to sell the dollars or, more often, the goods imported with those dollars, at a huge markup. To make matters worse, the government went through bouts of overspending, which exhausted its available foreign exchange, followed by excessive restrictions, including periodic bans on "luxury" imports that largely served to drive up prices and enrich those who managed to import them anyway. Even though the labor force was better educated than it is now, the economy performed poorly. National income adjusted for inflation fell more than 20 percent between 1977 and 1989 while population rose at a brisk clip. As a result, per capita income fell by nearly half. According to the IMF's calculations, Iran's economic growth should have been 7.2 percent a year between 1977 and 1989, but the economy actually shrank 2.4 percent a year. The government's surveys on household budgets confirm the dramatic decline in living standards. Adjusted for inflation, the average urban household's income fell in 1988 to less than half its pre-revolutionary level. The modern middle classes and professionals were particularly hard-hit while those with good political connections did well. The Iranian leadership blamed economic problems on the war with Iraq, but there is little evidence that this was the case: Without the war, the inappropriate revolutionary policies would probably have led to much the same result. Having criticized the shah for excessive dependence on oil exports, the revolutionaries did worse: Oil's share in government revenue and exports rose as non-oil revenues and exports fell. Oil exports, which suffered in 1980-82 from the continuing impact of the revolution and then the start of the war, recovered in 1982 to 1.7 million barrels a day and then stayed more or less at that level throughout the remainder of the decade. The economy did well for a time after the war ended in 1988. Ali Akbar Hashemi Rafsanjani took over as president in 1989, soon after Khomeini died. Rafsanjani, the first Iranian revolutionary leader to prioritize economic development, inaugurated the Islamic Republic's first five-year plan, which sought to roll back state control. Under the limited reforms he introduced, the economy recovered nicely with real GDP rising 8 percent per annum between 1988 and 1993. Iran increased its oil production over the same period from 3 million barrels per day to 3.9 million. But even with the injection of oil income, the government spent beyond its means. Determined to show that the privation of the war years was over, the Rafsanjani government ran up a $28 billion foreign debt, much of it short-term borrowing. This money, raised mostly in Europe, financed a wave of imports, which soon doubled to $24 billion a year. Personal income rose 20 percent in the first three years after the cease-fire but, just as under the shah, such an increase did not match Iranians' expectations. Revolutionary authorities had long told Iranians that after the war ended, their lives would be better than they had been under the shah. While revolutionary authorities had been able to improve the basic social indicators— infant mortality had been cut in half; consumption of staples such as meat, sugar, and rice increased; ownership of consumer items including telephones and washing machines rose—by 1991, income was still only about 60 percent of its pre-revolutionary level. For all of Rafsanjani's hopes, his reforms did not progress very far. Entrenched revolutionary interests fought to protect their sinecures, and Rafsanjani was unwilling to risk confrontation. The limited character of reforms can be seen by the charade of privatization. In most cases, privatization consisted of selling shares in the state-owned firms to state-owned banks. Gasoline prices remained highly subsidized. In 1993, Oil Minister Gholamreza Aqazadeh warned that fuel subsidies cost $6.3 billion. Foreign exchange remained subject to complicated rules that encouraged corruption. Rafsanjani's standing as a reformer also eroded as his family members enriched themselves and openly engaged in influence-peddling. Indeed, at around this time, the term aqazadeh—son of an important person—entered Iranian parlance to describe family members of high-ranking figures who cashed in on their positions. Powerful foundations used their political connections to stifle competition, especially the Imam Reza Foundation that owned 90 percent of the arable land in Khorasan, and the Foundation for the Oppressed and Self-Sacrificers (Bonyad-e Mostazafan va Janbazan) that ran industries employing 400,000 workers and controlling $12 billion in assets. After 1993, the economy was hit hard by the combination of stalled reforms and the exaggerated postwar boom. When the oil market weakened, Tehran was no longer able to service its substantial foreign debt. The Central Bank declared a moratorium on most debt payments, and new loans came to a halt. The Rafsanjani government had little choice but to throttle back on imports so that Iran's oil income could be used to repay its foreign debt. That required reversing the postwar market reforms and returning to the unpopular government-controlled allocation of foreign exchange. Imports were cut almost in half in 1994 while payments on the foreign debt reached $5 billion. The debt crisis, which lasted five years, brought an end to the postwar boom. The popular mood was sour, and Iranians blamed their government's hard-line policies, especially its isolation from the United States. The Rafsanjani government had hoped to offset the worst effects of the foreign debt fiasco by attracting foreign direct investment in its oil and gas production, a remarkably bold initiative given the historical sensitivity in Iran about oil nationalization. But, again, reality fell short. After a sharp deterioration in U.S.-Iranian relations because of Tehran's support for terrorism and opposition to Israeli-Arab peace, President Bill Clinton forbade U.S. firms from making oil investments in the Islamic Republic, effectively torpedoing the deal that Tehran had negotiated with the U.S. oil firm Conoco. Two months later, he reinforced the policy by banning all investment in and trade with Iran. In 1996, Congress passed the Iran-Libya Sanctions Action, designed to press European and Japanese firms to eschew investment in the Iranian oil sector. Tehran's failure to offer attractive business terms simply compounded the problem for Iranian industry. Rather than allowing straightforward foreign investment, Iranian officials insisted on complicated "buy back" arrangements in which foreign oil companies were required to invest money up-front and receive oil in payment. Nationalistic pride and exaggerated expectations about Iran's importance to oil firms led Tehran to negotiate too hard, leading many willing partners simply to stall or walk away. Once again, Iran's assumption was that its oil wealth would in the end prove its trump card—and once again, Iran was wrong. Through much of the Islamic Republic's first two decades, vigorous political debate within the narrow limits set by the revolutionary authorities has resulted in several changes in government leadership while real power always remained in the hands of the revolutionaries overseeing the formal government structure. The surprising 1997 landslide presidential election of reformist Mohammad Khatami inaugurated a short period when widespread reforms appeared inevitable. Then came the conservative reassertion, with violent repression and engineered elections spearheaded by the supreme leader and Revolutionary Guard veterans, leading eventually to the 2005 triumph of Mahmoud Ahmadinejad. Through all these maneuverings, inappropriate economic policies have been constant. The Iranian government wastes billions each year on subsidies and inefficient capital-intensive industries while small businesses drown in red tape and millions of young people face unemployment or underemployment. If Khatami had well-formed and articulate social and political views, he had no comparable economic expertise. His long-awaited August 1998 Economic Rehabilitation Plan was blunt in its description of problems but modest in its proposals, and his third five-year-plan, announced the following year, was no different. Different political factions agreed that the economy was in bad shape and that drastic changes were needed, but no one was willing to tackle the entrenched interests that supported subsidies for consumer goods, which drained public coffers, or rampant corruption, which scared off foreign investors. Failure to make headway on economic reform led to lackluster performance between 2000 and 2004. When the third economic plan was drafted in 1998, Iran's oil and gas exports were at their lowest level since the Iran-Iraq war, totaling only $9.9 billion for the year. As oil prices rose sharply, Iran's oil and gas exports shot up to $36.8 billion during the plan's last year. As Arab states such as the United Arab Emirates, Qatar, and Kuwait diversified their economies and investments to become less dependant on oil revenue or at least built up financial reserves abroad to cushion their economies in the event of a downturn in oil revenue, the Iranian government grew more reliant on oil revenues, which, by 2004, provided 64 percent of the government's income without calculating massive, implicit subsidies from cheap energy. Thanks to the buoyant oil income during the plan period, consumption grew handily at a rate of 6.6 percent per year, and unemployment fell somewhat, but even this was not impressive given the far greater performance of oil economies elsewhere in the region. By 2000, many Iranians had grown disillusioned with Khatami as regime elites—both hard-liners and reformers—diverted much of the oil wealth into their own pockets. In 2006, the IMF published a pessimistic assessment of Iran's economic prospects even if world oil prices remained around $65 per barrel. The organization predicted that between 2007 and 2011, inflation would remain at 17 percent a year, the government budget would slip into considerable deficit, and the unemployment rate would gradually increase from 11 percent in 2005 to 13.2 percent in 2010. The Iranian government's estimate that the labor force is growing by 700,000 per year almost certainly understates the number of people who would like to work since many young women no longer even bother to look for jobs. Skyrocketing oil prices have far exceeded IMF forecasts. The Islamic Republic's oil and gas exports between March 2007 and March 2008 were higher than the combined total for all four years of the first Khatami term. Despite this windfall, economic conditions have deteriorated far beyond the IMF forecast. In mid-2008, Iran's Statistics Center estimated unemployment at 11.9 percent with the rate for those aged 15 to 24 reaching 25.6 percent. Were oil prices to fall, the situation would be grim. Should oil prices fall significantly, the Iranian regime could not easily cope. Insofar as Tehran's dependence on high oil prices distorts the economy, Ahmadinejad's administration has made it even more vulnerable. The Iranian president has exacerbated the worst aspects of past economic policies: He has expanded price controls, increased subsidies, and tied bank credits more to political factors than to business considerations. He has implemented some economic reforms but only halfheartedly. Consider the long-debated move to ration energy supplies, a policy recommended by Iranian economists and their World Bank colleagues because of the lack of political will to raise energy prices to their actual cost. Rationing began in June 2007 but has been steadily undermined by periodic announcements of extra rations for populist reasons, such as summer and New Year's vacations. In addition to the monthly 26-gallon ration at $.48 per gallon, motorists can purchase extra amounts at $1.91 per gallon. While these measures may have slowed the growth of gasoline consumption, the total amount of gasoline sold in Iran in March 2008 was, at 618,300 barrels per day, above the 566,000 b/d pre-rationing level—hardly surprising given that the Islamic Republic is proudly pushing automobile production. With Iran's refineries uninterested in producing gasoline for which they receive such meager prices, the Iranian government has been forced to rely on imports. While these have oscillated, in 2006, for example, they amounted to 192,000 barrels per day. Those imports have become harder to obtain as Western banks have stopped offering letters of credit; two major suppliers—Reliance of India and Vitol of Switzerland—quit the Iranian market in 2007. Continuing energy subsidies cost Iran $45 billion a year, according to former Central Bank governor Mohammed Hossein Adeli. But even with that expenditure, the Islamic Republic cannot guarantee its citizens a secure energy supply. Natural gas consumption, on which most Iranians depend for heating and cooking, continues to be highly subsidized with the result that consumption is booming, forcing Iran to import more gas than it exports even though Iran has the world's second largest reserves. The government has difficulty paying for imports. When Turkmenistan cut off supplies in the midst of one of the coldest spells of weather Iran had experienced in decades in order to pressure Tehran to pay higher prices, the Iranian government had to shut off gas supplies to at least 1.4 million people. The real state of Iran's economy is becoming harder to judge as economic data becomes increasingly untrustworthy; for instance, Ahmadinejad's first minister of industry and mining, Eshaq Jahangari, reported that Ahmadinejad once ordered him to falsely double the reported economic growth rate. Ahmadinejad's 2008 budget was devoid of the detail that normally accompanies such documents. In order to make up shortfalls, the Ahmadinejad government has repeatedly raided the Oil Stabilization Fund, meant to accumulate a reserve when prices are high, as at present, for use when prices drop. Despite statutory provisions dictating that it is to receive the excess between the budget's estimated oil income (traditionally set conservatively) and actual revenue, the fund's balance actually decreased between March 2006 and December 2007, a period for which the fund should have received tens of billions of dollars. Annoyed at the few constraints he faced in such raids, Ahmadinejad simply dissolved the board charged with administering the fund. Ahmadinejad often denies that standard economic principles apply to Iran. The most acute controversy has been about inflation. To the chagrin of many Iranian economists, the president denies that increasing the money supply 40 percent a year contributes to inflation. His anti-inflation policy centers on lowering the interest rate, first to 12 percent and then to 10 percent for most loans with his goal being to bring it into the single digits; sometimes he speaks about eliminating interest altogether on most bank loans. He has fired several top officials including two Central Bank governors and an economy minister for opposing this policy. Not surprisingly, its application has resulted in demand for loans that vastly exceeds supply, meaning that the only people who can get loans are the politically well-connected. By the government's own accounting, inflation has increased to 24 percent although many observers think the figure an understatement. Iran has been hit especially hard by the worldwide increase in food prices, particularly for wheat and rice, which are staples of the Iranian diet. With price controls, loans hard to come by, and oil income allowing a flood of imports, production inside Iran is unattractive. With nowhere else to put their money, Iranian investors have speculated in real estate, a phenomenon that has widened the gap between poor and rich into a chasm. Mid-level bureaucrats or high school teachers might make a monthly salary of $300, but upscale apartments in Tehran sell for $600-$1,000 per square foot. One 15,000 square foot apartment in Tehran recently sold for $21 million. A whole industry has arisen to furnish the palaces of the nouveau riche. This mix of developments—huge profits for the wealthy and unprecedented oil income on the one hand, and rising unemployment and soaring inflation on the other—is politically explosive. While Ahmadinejad grabs headlines in Iran for his economic policies, real power on the issue rests with the supreme leader, Ali Khamenei, who has only fitful interest in the problem. While he makes sensible general statements from time to time, during his presidency (1981-89) he consistently advocated the same kind of oil-centered, statist, populist policies that Ahmadinejad now implements. Khamenei appears skeptical of any economic reform proposals. His hatred of the West may contribute to his distrust of economic reform, perhaps, because he sees basic economic principles as Western. He speaks often with evident passion about his conviction that the Islamic Republic is deeply threatened by Western cultural invasion, which could overthrow the regime as quickly as the Eastern European communist regimes fell. As the nuclear confrontation between the West and Iran has accelerated, the U.S. government has developed an effective program of "informal sanctions" to press banks around the world to restrict or cut ties with Iran. By emphasizing the shady transactions in which Iranian banks have engaged, the U.S. Treasury Department has persuaded several important banks to withdraw from Iran; the number of foreign branches operating in Iran dropped from twenty-six in 2006 to twenty in 2008. In February 2008, the 32-nation Financial Action Task Force—the major body monitoring money laundering for illicit activities—warned of Tehran's "deficiencies" at preventing money laundering for terrorism and weapons of mass destruction development and called on banks to exercise "due diligence" when dealing with the Islamic Republic. Iranian officials complained that not only European but also Chinese banks cut their activities in Iran. Denied bank services, Iranian traders had to carry suitcases of cash to pay for imports. International sanctions have also played a part even if the need for international consensus watered them down significantly. The U.N. Security Council adopted three resolutions placing restrictions on financial transactions for Iran's nuclear or missile programs, including banning transactions with one bank and urging diligence about other financial dealings. The Security Council resolutions also ordered tight limits on the export of "dual use" goods that could benefit Iran's nuclear or missile programs, some of which also have important civilian uses. The European Union imposed further restrictions, which some European countries implemented with vigor. The effect has been to make Iran a less desirable market for European firms. For instance, German exports to Iran have fallen sharply in recent years while export credits backed by the German government were only 20 percent of the 2004 level in 2007. While there is no reliable estimate of how such financial sanctions have hit Iran, it would be safe to say that their direct cost is in the billions of dollars a year, and they have made the Islamic Republic even less attractive as a business destination. Both because of Tehran's own internal economic difficulties and its political radioactivity, few foreign industrial firms have sought to locate inside Iran, other than Renault, which built a large automobile assembly plant. Not even its oil and gas reserves have tempted foreign companies to invest significantly in Iran. British and French government pressure reportedly led Shell and Total to postpone development of a large natural gas project; Japanese firms backed off from the large Azadegan oil and gas field development for the same reasons. That creates a real problem for Iran's oil-centered economic development model. Each year, Iran's oil fields produce 500,000 barrels per day less oil, according to Iran's oil minister. Iran's National Oil Company has used domestic financing and expertise to mitigate this decline, but Iran has made painfully slow progress at realizing its 20-year-old ambition to raise production capacity to 6 million barrels per day. Indeed, capacity is substantially lower than it was thirty years ago. While Iranian firms are developing Azadegan on their own, they are proceeding at a fraction of the hoped-for pace with foreign partners. The same is true of other major oil and gas projects, such as the construction of Iran's first liquefied natural gas facility to export gas by ship. Ahmadinejad's attitude seems to be similar to that of his predecessors: that, at the end of the day, Iran's ample oil and gas reserves will make up for any shortcomings. And to be sure, the oil income increase of recent years is arguably the single most important reason Iran has been able to carry on its aggressive foreign policy, confront the international community about its nuclear program, and boldly support anti-American forces across the Middle East if not the world. Through war, revolution, and factional battle, there has been one Iranian constant: erratic financial policies which have frittered away the country's impressive economic potential. When the shah tried to force a rate of growth after 1973 that was not achievable, the economy stalled and social problems mounted, setting the stage for the Islamic Revolution in 1979. Once in power, the revolutionary authorities implemented the worst aspects of Third World socialism with predictable results: The economy went downhill—a situation compounded by the long war with Iraq. Postwar, sporadic economic reforms resulted in modest results but have been insufficient to absorb the baby-boom generation. The result is that the income of the average Iranian is not much higher than it was thirty years ago. Had oil income been more limited, Tehran would have long ago been forced to undertake far-reaching structural reforms, much as the shah undertook in the early 1960s. As then, the result would have been rapid growth. Instead, policymakers have let their ideologies prevail over common sense and economic wisdom, convinced that high oil income would sustain the country. Even as oil prices reach record levels, the Islamic Republic's leadership may soon find how wrong such a conviction is. Patrick Clawson, Middle East Quarterly senior editor, is deputy director for research at the Washington Institute for Near East Policy. Tehran Times, May 4, 2008; Fars News Agency (Tehran), July 16, 2008. "Statement at the Conclusion of the 2008 Article IV Consultation Mission to the Islamic Republic of Iran," news release, International Monetary Fund (IMF), Washington, D.C., May 12, 2008. The section on the imperial era, the revolution, and the Rafsanjani-Khatami period draws upon facts and figures cited in Patrick Clawson and Michael Rubin, Eternal Iran: Continuity and Chaos (New York: Palgrave, 2005), pp. 69-86. Islamic Republic of Iran: Selected Issues (Washington, D.C.: IMF, 2004), p. 7.
 International Bank for Reconstruction and Development, Current Economic Position and Prospects of Iran, Report SA-23a (restricted), May 13, 1971, vol. 1, p. 13. Quoted in Ali Ansari, Modern Iran since 1921: The Pahlavis and After, 1st ed. (London: Longman Publishing, 2003), p. 184. Jalal al-Ahmad, Occidentosis: A Plague from the West (Gharbzadegi), R. Campbell, trans. (Berkeley: Mizan Press, 1983). Ayatollah Khomeini on Tehran radio, Sept. 8, 1979, trans. by Foreign Broadcast Information Service (FBIS), Sept. 10, 1979, and reprinted in Barry and Judith Rubin, eds., Anti-American Terrorism and the Middle East (Oxford: Oxford University Press, 2002), p. 35. Islamic Republic of Iran: Selected Issues, 2004, p. 14. Patrick Clawson, "Alternative Foreign Policy Views among Iran's Elite," in Patrick Clawson, ed., Iran's Strategic Intentions and Capabilities (Washington, D.C.: National Defense University Press, 1994), pp. 34-6. Eliyahu Kanovsky, Iran's Economic Morass: Mismanagement and Decline under the Islamic Republic (Washington, D.C.: The Washington Institute for Near East Policy, 1997), p. 21. Clawson and Rubin, Eternal Iran, pp. 115-38. "H.R. 3107, The Iran and Libya Sanctions Act of 1996"; CNN News, Aug. 5, 1996. Data on oil exports are from Islamic Republic of Iran: Statistical Appendix: March 2007 (Washington, D.C.: IMF, 2007), p. 6; Islamic Republic of Iran: Statistical Appendix, September 2003 (Washington, D.C.: IMF, 2003), p. 7; Islamic Republic of Iran: Recent Economic Developments, September 2000 (Washington, D.C.: IMF, 2000), p. 135. These are also the sources for the data on oil and gas exports during 1997-2001 cited below. Islamic Republic of Iran: Staff Report for the 2005 Article IV Consultation (Washington D.C.: IMF, 2006), p. 31. Abrar-e eqtesadi (Tehran), Feb. 10, 2008. Financial Times, Feb. 28, 2008. Middle East Economic Survey (Beirut), May 19, 2008, p. 19. Middle East Economic Survey, Apr. 7, 2008; on Iran's gasoline imports, "Country Analysis Brief: Iran," U.S. Energy Information Administration, Washington, D.C., Oct. 2007, accessed July 2, 2008. Middle East Economic Survey, Feb. 11, 2008; Iran Times (Washington, D.C.), Jan. 18, 2008. Mustafa Pur-Mohammad, Iranian interior minister, quoted in Iran Times, Jan. 18, 2008; Associated Press, Jan. 22, 2008. Ali Alfoneh, "Ahmadinejad versus the Technocrats," AEI Middle Eastern Outlook, May 2008, p. 6; Norooz (Tehran), Jan. 14, 2008; Middle East Economic Survey, Jan. 14, 2008. Middle East Economic Survey, Jan. 14, 2008; Islamic Republic of Iran: Statistical Appendix: March 2007, IMF. Alfoneh, "Ahmadinejad versus the Technocrats"; Financial Times, Apr. 23, 2008, May 16, 2008. Mehdi Khalaji, "Iranian Parliamentary Elections and Ahmadinezhad's Discontents," PolicyWatch, no. 1364, Washington Institute for Near East Policy, Washington, D.C., Apr. 22, 2008. Iran Times, June 6, 2008; Financial Times, Mar. 14, 2008; The New York Times, Feb. 3, 2008. Karim Sadjadpour, Reading Khameini (Washington, D.C.: Carnegie Endowment for International Peace, 2008), pp. 17-9. The New York Times, Feb. 29, 2008; Los Angeles Times, Jan. 20, 2008; Financial Times, Feb. 12, 2008. The New York Times, Feb. 29, 2008. UNSCR 1737 (2006); UNSCR 1747 (2007); and UNSCR 1803 (2008). Financial Times, Feb. 12, 2008. BBC News, Oct. 6, 2004. Associated Press, May 12, 2008; Economist Intelligence Unit Views Wire, May 13, 2008; Middle East Economic Survey, June 2, 2008. Middle East and Africa Oil and Gas Insight (London), Nov. 2006. Related Topics: Iran | Patrick Clawson | Fall 2008 MEQ receive the latest by email: subscribe to the free mef mailing list This text may be reposted or forwarded so long as it is presented as an integral whole with complete and accurate information provided about its author, date, place of publication, and original URL.